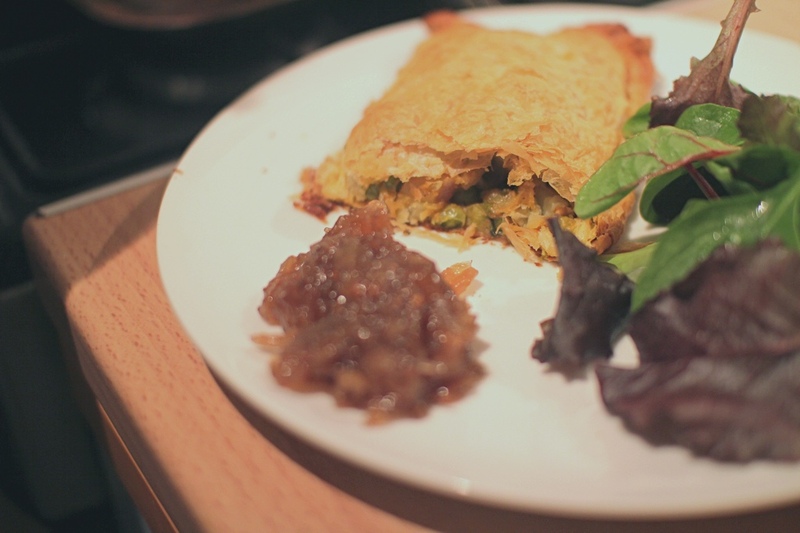 This pasty is very easy to make – simply boil some potatoes and peas and fry onions, curry paste, coriander and mustard seeds then wrap the mixture in puff pastry. I much prefer it the next day reheated in the microwave for a couple of minutes, as it makes the pastry more dense and less flaky. It goes nicely with a big dollop of chutney and some salad. You could also add some pickled onions and cheese to make it in to an alternative ploughmans lunch. Be careful not to overcook the pasties or they will be too hard. Makes 4. Enjoy! Heat oven to 200 degrees/gas mark 6. Heat a large pan of water, add the potatoes, then cook for 8 mins until just soft. Add the peas 2 mins before the end of cooking time. Drain, then set aside. Meanwhile, heat the oil in a frying pan. Fry the onion until soft and slightly coloured. Add the curry paste and mustard seeds, then fry for a few mins more until the mixture smells fragrant. Carefully stir in the potatoes and peas, trying not to mash them, and finally the coriander. Unroll the pastry rectangle, place on a floured surface with the long side towards you and roll it out a little more to make it into a square shape. Cut into 4 squares, then cut each one in half so you have 8 long rectangles. Place 4 of them onto a baking sheet, brush the edges with beaten egg and place a quarter of the filling down the centre of each. Top with the remaining pastry, then pinch the edges together to make a sealed parcel. Brush with more egg, then bake for 20 mins until puffed and golden. Serve with fresh green salad and a spoonful of chutney.